PUNKED! 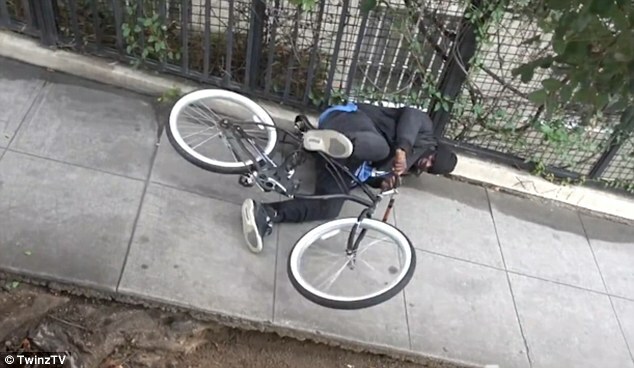 Bike Thieves Fooled By Electrocuting Bike…HILARIOUS Theft Attempts All Caught On VIDEO! This is the hilarious moment a group of pranksters fitted electric shock devices to a bicycle before setting them off and zapping passers-by when they tried to steal the bike. The pranksters, brothers Jeremy and Jason Holden, kitted out an ordinary push-along bike with shock devices in the handlebars and seat before leaving it out in the street in Los Angeles, US. They sat quietly in hiding as they waited for passers-by to pick up the seemingly-abandoned bike in Hollywood, filming every moment with a number of handheld cameras. When an unknowing member of the public picked up the bike and tried to make-off with it, the brothers – using a handheld button – allowed the shock devices to release small charges. Over a number of hours, they filmed several people trying to steal the bike – and then being thrown from it after being shocked by the electric zap. Amusing footage shows the brothers asking ‘What happened buddy? Trying to steal a bike?’ to some of the men who came off the push bike after being stunned by the shocks. On one occasion, a man went straight over the handlebars and landed in shrubbery next to a tree after being shocked. Another piece of footage shows a man skidding off the bike and landing on the pavement. Posting the footage on YouTube channel TwinsTV, the brothers said the prank would form part of an upcoming film they plan to release. The brothers, joined by friends, are known across the US for playing large-scale pranks on unwitting members of the public. While their pranks are usually taken in good faith, the brothers did find themselves hauled before the authorities in summer 2014 and charged with misdemeanour disorderly conduct. The twins, who were 25 at the time, were charged after staging the fake kidnapping of their four-year-old nephew at a park in Sequim, Washington. They said they were making a video to promote child abduction awareness, and later posted the film on YouTube. The men were aware that unknowing onlookers might take the scene in the wrong way, so they prepared by calling police to warn them that they were filming a video to promote ‘kidnapping awareness’. But authorities said they did not consider the phone call sufficient warning. The video shows the men donning masks as they drive towards the park while heavy guitar music plays. They pull alongside the park as the boy sits on the bench before one jumps out, runs towards him and picks him up – before returning to the van just seconds later. Panicked parents scream and run after the boy as they frantically try to take note of the van’s license plate number. Afterwards they returned to the park to explain to the worried parents what they had been doing and to assure them the boy was safe – but they were met with anger. The boys may be pranking, but their work seems to suggest a civic virtue. Raising awareness of kidnapping is an important issue, though it seems that they could have manufactured a less-alarming experiment. However, shocking would-be bike thieves is as good a public service as anything. Those who take that which is not theirs deserve to get shocked and, admittedly, much worse.